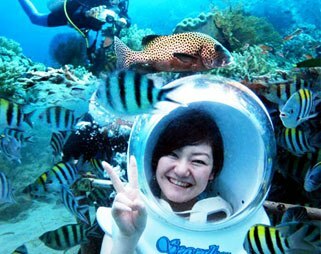 Bali Marine Sports are the exciting and fun seawater activities with great challenge for everyone who joins this sport. It offers variety of marine post activities from motorize until the manual one. 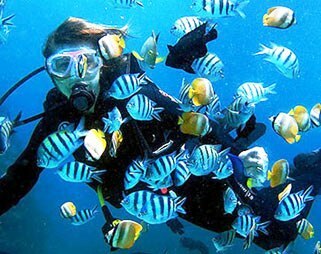 It is one of the great seawater adventures in Bali giving the fantastic experience from every activity like Jet Ski, Banana Boat, Fly Fish, Snorkeling, Para sailing, Diving, Fishing, Glass Bottom Boat and Turtle Island Tour. The Marine Sport Packages are also available with attractive choice of sport activities and competitive prices. 간단히 갈아입을 옷, 선크림, 기타 소지품 등 을 챙기는데, 귀중품은 될수있으면 호텔에 두고오는 것이 안전하다. 해양스포츠를 즐길 시 착용할 옷으로 갈아입고(탈의실), 업체 가이드의 안내에 따라 순서대로 안전 수칙에 따라서 프로그램을 진행 받으면 된다. 저희 프리스타일 발리는 해양스포츠 예약 대행업체로 모든 현장에서 발생된 문제에 관하여는 중간자 입장에서 원만한 해결을 위해 성실히 임하겠지만 그 외 도의적, 법적 책임은 없습니다. Para sailing activity will bring you to the exciting experience by hook your self in airborne for a second and you will get free to enjoy the amazing view of the island from the over head. Beautiful scenery of the sea water is easily found by flying like a bird with string more then 100 meter up makes this activity really unforgettable memory in our life. 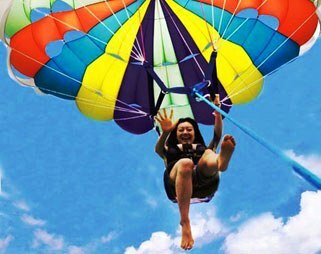 You can get Para sailing Adventure right now as your choice during your vacation in Bali Island. Note : Additional charge of 3% from the total price will be added if payment settled by credit card. Snorkeling is a fantastic marine activity to overview the beautiful underwater world panorama of coral, colorful fishes and other unique marines life. This adventure will bring you the exciting and unforgettable experience on this great discovery with professional snorkeling guide who guide you to the right snorkeling spot point located in Tanjung Benoa Beach with fresh seawater and multifarious of tropical fish. It will take about one hour to explore and view beautiful underwater life which is well equipped by safety snorkeling gear involves life jacket, fin, snorkel, glass masker and snorkeling guide. 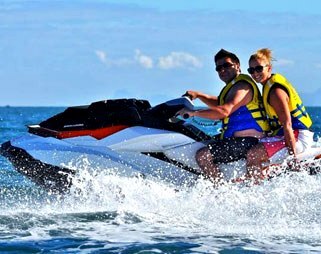 Jet Ski is one of the exciting marine sport activities by driving motorize ski to explore the beautiful beach of Tanjung Benoa, south part of Bali will get different experience and the fresh sea breeze will swirl your hair. This sport is well equipped by life jacket and accompanied by the professional Jet Ski Guide to ensure your safety and security adventures. Bali Jet Ski is centralized at the beautiful beach with white sand stretch 3 kilometers from Nusa Dua to the peninsula of Bali. These Activities will bring you the great experience during your vacation in the Paradise Island of Bali. The Jet Ski is supported by 700 cc motorizes jet power to break the wave fast and fully turn moving that is ideally for everyone who enjoys the challenge. This adventure is extremely enjoyable within 15 minutes to surround the beach area with professional Jet Ski Guide. 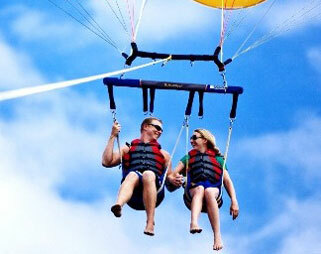 This adventure brings you to the fun situation along with partner or group which can give the memorable experience. 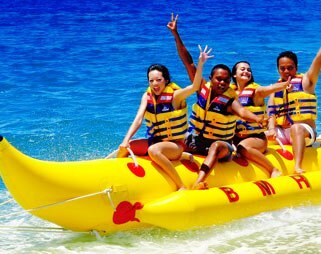 The adventure ride on the Banana Boat is the most spectacular marine activities to explore the beautiful beach of Tanjung Benoa Beach in south part of Bali. This is one of the spectacular water activities to explore the warm and blue seawater within 15 minutes on each trip. The professional boat captain will ensure you to enjoyable on your adventure with safety equipment and driving. 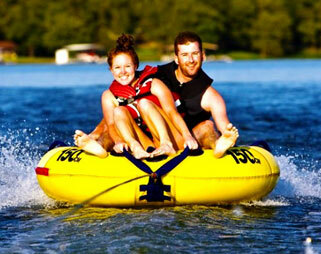 The surprise movement on Banana Boat riding is one of the fantastic moments and gives you unforgettable memory. Fly Fish flies to dash against the wind sweeping that it real fly on the seawater. It is a great adventure by flying like fish jumping on the seawater with high boat speed. You will enjoy the attractive adventure like Fly Fish with the professional Fly Fish Guide who accompany you on each flying and the high quality safety equipment that ensure your experience are memorable one. 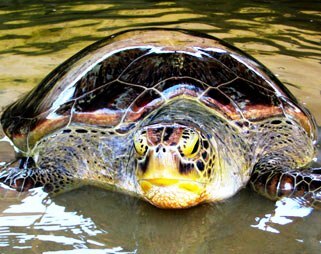 Turtle Island Tour is an exciting tour to visit a small island with turtle conservation located in Tanjung Benoa, south part of Bali. It is an optional experience to visit the scarce animal like turtle in the beautiful island surrounded by the white sand and overlooking to the magnificent view of beach and mangrove forest. Bali Is famous for beautiful dive spots for licensed Divers as Amed, Tulamben, Menjangan and many others but for you who first time want to feel and try a safety diving, here is the Place. Nusa Dua is one of the beautiful dive spot for the beginner in the South part of Bali. it will take about 1 hour from the sort briefing start and will about 20~30 minute in the under water is the safe time for the begainner to enjoy the coral reef and variety of fish. 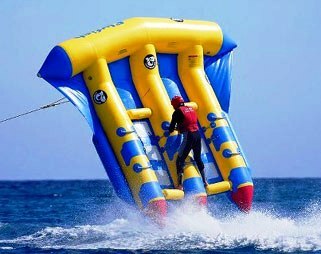 Bali Seawalker is an underwater activity that offers everyone an opportunity to enjoy an underwater experience with the minimum of equipment. The ‘walks’ utilize a specially-designed helmet that is connected to oxygen tanks aboard a boat, providing participants with a constant flow of air to breathe underwater. Participants with prescription lenses need not take their glasses off to enjoy the activity due to the convenient helmets, and will remain dry from the chin up throughout the tour. Depths are approximately seven metres, where you will soon be able to observe colourful schools of fish, coral reefs and marine life. Bali Seawalker operates at two main sites; off Sanur and Tanjung Benoa. Bali Fishing will take the location in the east and south of Bali island that is rich of many kind of fish. This fishing trips starting from Tanjung Benoa, Nusa Dua – Bali. 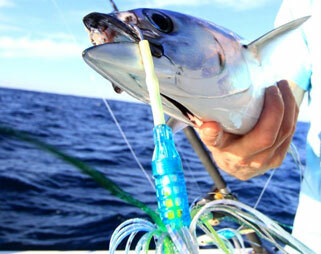 We will bring you to the fishing spot for catching Tuna, Bonito, Mahi-mahi, Sea bream, Barracuda and many others. Your fresh fish can be cook at Bar & Restaurant. 21% Government tax and service charge, 5 hours fishing, Medical insurance, Towels, Free using locker, free transfer from and to hotel, Fishing gear, lunch box.